I went in Thursday and was told that there hadn't been much change since the last appt- 2cm and about 75% effaced and that I probably wouldn't deliver this weekend. So we decided to go to Jack's family reunion in Kaysville. Last night we had dinner and played games at his bro's house and then spent the night. We drove home this morning and right now I'm just relaxing at our house while Olivia takes a much-needed nap, then she and I will head over to a giant slip-n-slide at the park where Jack is with his whole family, then back up to Kaysville in the morning. I've had a few contractions here and there, but nothing to make me think the baby is in any rush. It's still weird to think that any day now we will be the parents of two daughters. Our lives are about to change again! Olivia sassed me for the first time this morning! She has thrown plenty of tantrums and protested things we have done, but this morning when I told her she couldn't watch TV and had to come get dressed she got right up in my face and yelled "NO!" I was a little taken aback! Girly will be two on Tuesday and is definitely acting the part. She knows what she wants and will not be made to do otherwise. Changing her diaper requires a full-on wrestling match (If her baby sister comes out battered it's because of all the blows I've been dealt trying to change her!). I know she is ready to be potty trained, she never goes to the bathroom when her diaper is off, and always tells me when it is dirty, I just don't have the energy or fortitude to train her until after the baby comes. I'm also afraid she will digress with the change of family life and make it harder to re-train her. So we are holding off for now. Hope your weekend is going splendidly! 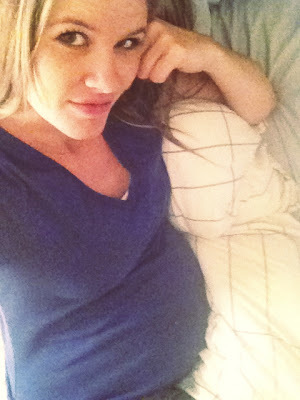 I will post pics of baby's nursery soon and of course keep you updated on when she arrives! ps. The orthodontist gave me a rubber band that hooks my top canine to my bottom molar and is to be worn "at all times, except when eating." Except I haven't been wearing it. Phew! It feels good to get that off my chest. Thanks for the support.